You’ve paid late fees more than once this past year. Ahem! You could have gone out to dinner or gotten a nice top from Thredup instead! Bills have a habit of sneaking up on you, even though the same ones come every month. What’s up with that? You don’t have a good way of tracking those bills that happen a few times a year. You run out of money and don’t have enough to pay the bills, even though you know you make enough money. What do financial gurus know that you don’t? It’s simple, track your bills in one place. 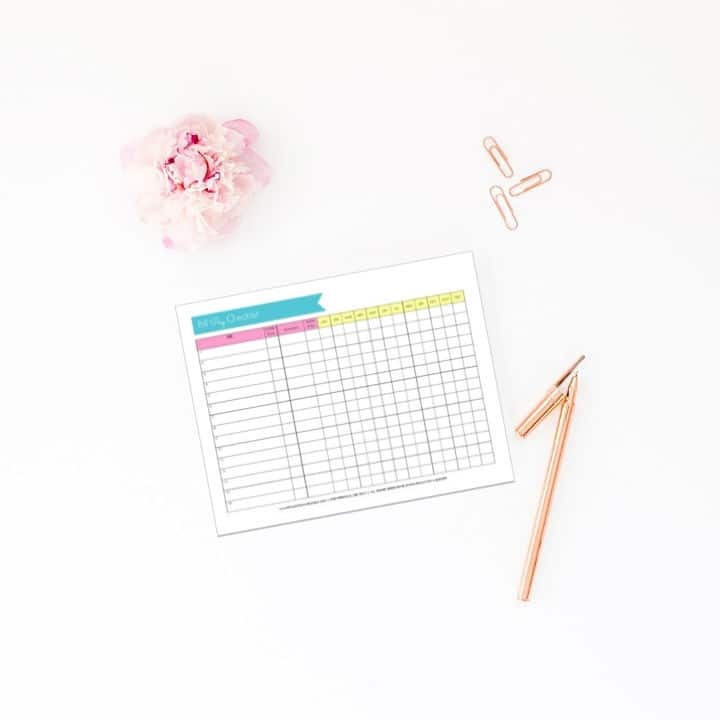 Whether you do this on Excel, a sheet of paper, or using my Bill Pay Checklist (pictured below) from my ebook and printables, Budgeting Made Easy. It doesn’t matter what you use, as long as you do it. 1. List all of your bills. Look at your credit card statements and checking account for bills that you pay on a regular basis. 2. Organize them by due date. Starting from the 1st of the month, organize each bill by the due date so that you can track them easier. 3. Create columns for each month and check off when you’ve paid each bill. 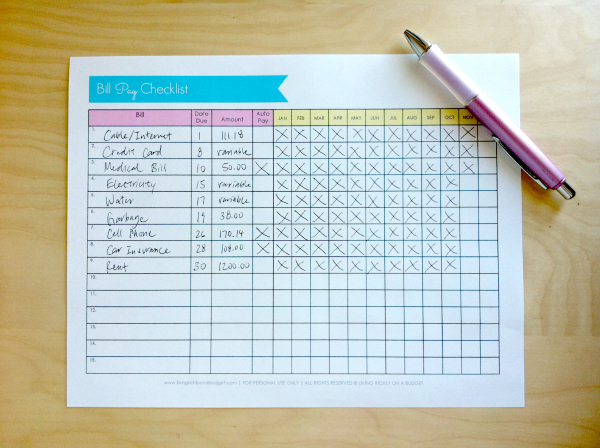 You’re simply creating a checklist so that you can track which bills you’ve paid. Also, be sure to track auto-payments as sometimes they don’t go through as planned. 4. Create a separate sheet or section for bills that are due a few times a year. Don’t forget to track those bills that come once or a few times a year, like your Amazon Prime subscription, car insurance, car registration, taxes, etc. 5. 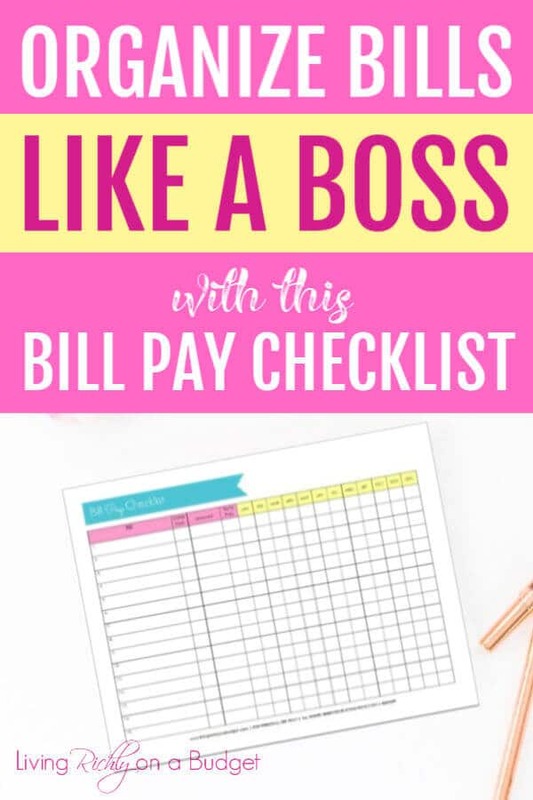 Place this bill pay checklist where you can see it every day. It’s important to display the bill pay checklist where you can see it regularly so you can stay on top of bill paying and avoid late fees! 6. Mark which bills are on autopay. Even with autopay, you still have to track and make sure the payment was completed. 7. When payday arrives, refer to the bill tracker to see which bills will come before the next pay period. Allot enough money to pay those bills. Put this money into a separate bill paying account, if you want to make it even easier. 8. Put these bills into your monthly calendar and repeat them every month. Use either your phone, calendar app, or planner to track monthly bills. 9. Communicate with your significant other (or anyone you’re splitting the bills with) about the upcoming bills. When it comes to bills and money, communication is everything! If you can’t communicate about money, it’s hard to move towards one direction to meet financial goals. If this is a difficult topic to discuss, work on it and be neutral when your partner talks about finances. Don’t get angry but be calm and listen. If it’s still difficult, then consider couple’s therapy. Want a step-by-step guide on creating a budget that you’ll stick with? 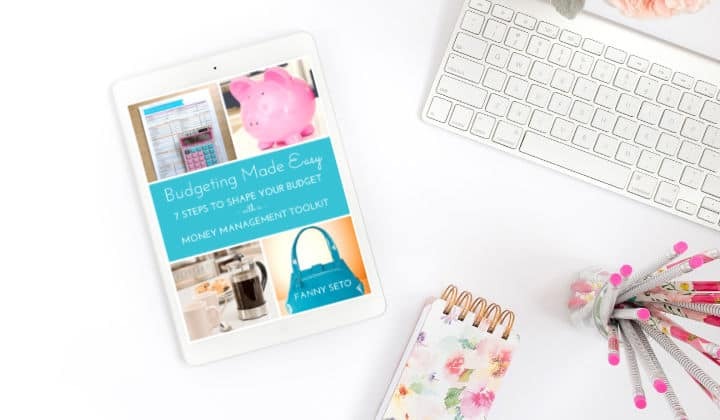 Check out my new book, Budgeting Made Easy:7 Steps to Shape Your Budget with a Money Management Toolkit. « Does Your Budget Spark Joy? I love lists and organizing things that’s why when it comes to tracking my money, I use three apps. Why three? Well, I can’t decide which one is the best so I’m using all of them. Haha! I used to input all my expenditures on Excel though but I didn’t find it cute. For bills I can’t pay with autopay or online, I set a monthly alarm on my phone to remind me. I use a very similar system. I really help so much. Between utility payments, credit cards, car payments…my spreadsheet gives me so much more control. Awesome! Glad you have a system in place!